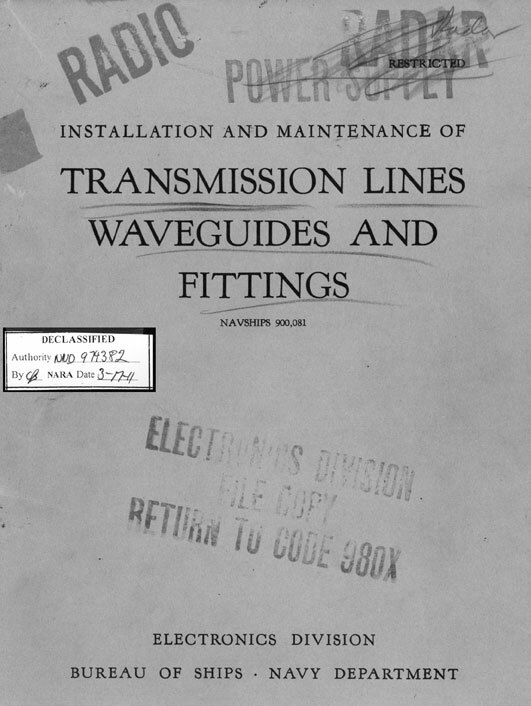 Transmission Lines Waveguides and Fittings, NAVSHIPS 900,081, 1945, decribes radio and radar transmission lines, cables and waveguides aboard ship. Washington 25, D. C., 20 February, 1945. 1. "Installation and Maintenance of Transmission Lines, Waveguides, and Fittings" (NAVSHIPS 900, 081), has been published as a reference book. Much of the material has appeared in other publications, but is gathered here under one cover for convenience. Much credit is due to installing activities for the basic work from which standard practices were developed. 2. The effectiveness of this publication depends upon the cooperation of the forces afloat and ashore in adhering to the principles presented and in providing an adequate number of copies to the personnel directly engaged in installation, maintenance, and training duties. Although this publication is classified restricted, the widest circulation is necessary to achieve this purpose. 3. Permission is granted to republish or reprint any material in this book in classified instruction books or maintenance manuals prepared for the armed forces. Copyright © 2011, Historic Naval Ships Association.